I love a good science demo but they can be a challenge! You have to manage behaviour, keep students safe, manipulate apparatus and at the same time give a clear, seamless commentary. But demonstrations have the power to engage and capture students’ curiosity unlike anything else, and they are unique to science lessons so that makes them even more special and worth mastering. It’s important to remember that whilst any demonstration can engage – students can be engaged and thinking about the wrong things e.g. the magnetic stirrer instead of the solute dissolving! The trick is to engage students to think about the important bits. Watch the video below on emulsions and note down what you think the intended learning outcome of the demonstration was and identify the specific things Walt does to make the demonstration successful. Be clear on your intended learning outcome(s) – conceptual or procedural? And always follow up the demonstration with a task that requires students to use the knoweldge they have just learnt. It could be a sequencing or labelling activity or simply answering some carefully crafted questions. Share expectations for great behaviour at the start of each demonstration. Don’t labour the point as it suggests that your are expecting off task behaviour. Tackle issues with one warning and then swiftly ask them to sit down if it continues. Have a periodic table ready for these students to copy – this removes the opportunity for further disruption – ‘what should I do Sir’? A great twist on the traditional science demo is to carry out the demonstration in silence. It’s a strange idea but by not talking, and using exaggerated actions, students become more focused on watching the apparatus/techniques as they can’t rely on spoken instructions. You can develop the idea further by asking students to write a method as they watch the demo, or perhaps just list items of apparatus that they will need if they are going to carry out the practical. Give it a try. A great way to check that students are clear on how to carry out the practical/demonstration is to see if they can spot deliberate mistakes. Once you have demonstrated the correct procedure, it can be repeated using a silent demo with some deliberate errors. Gather students around the demonstration bench with a pen and piece of paper for them to write with. Ask them to list all the deliberate errors that were made. You can then go through the list and they can tick them off. The best errors are the ones that students are likely to make e.g. overfilling the solvent in chromatography, or lighting a Bunsen with the air-hole open. Extend the task by asking students to explain why the mistake was wrong, and what effect it would have on the result/safety. The predict, observe, explain (POE) strategy is an incredibly useful framework to help structure a demonstration and focus what students are thinking about. It is also a great way to surface existing conceptions that students bring to the classroom. You start by setting the scene, showing the students the various chemicals and apparatus. You then pose a question, e.g. what will happen when I place a can of coke in water? Students then have a minute or so to discuss the question and come up with their prediction of what is going to happen. They can write this down or you can assemble class ideas on the board. The teacher then carries out the experiment. Students then need to reflect on their prediction and explain the observation. To spice things up a little you can then do another POE, but this time modify one variable e.g. what will happen when I place a can of diet coke in water? As discussed above, it’s important students have sufficient background knowledge to be able to solve the problem, or at least come close. 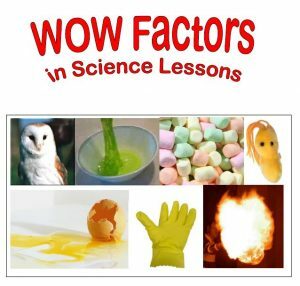 Science demonstrations to make your students go WOW! Science demonstrations to make your students go Wow! This fantastic resource, created by the students and tutors from the University of Worcester, is a collection of science demonstrations to amaze. I first saw these experiments showcased by training teachers at the ASE conference in Birmingham – they were brilliant! Here is a great film by science teacher Alom Shaha as he goes on a journey to explore the use of demonstrations in science teaching.